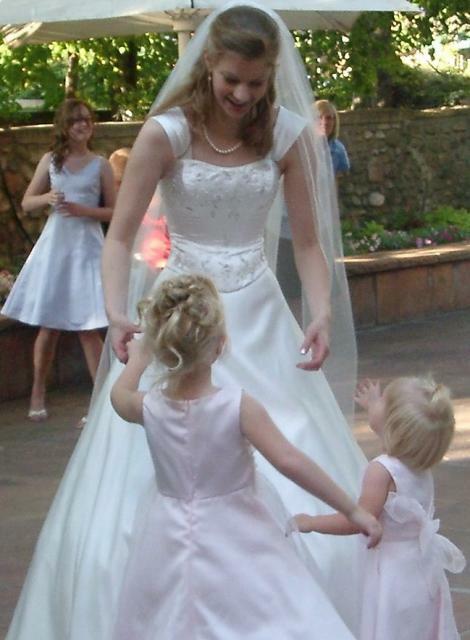 Jessie, our niece, dancing joyfully with her nieces, Hannah and Jane. 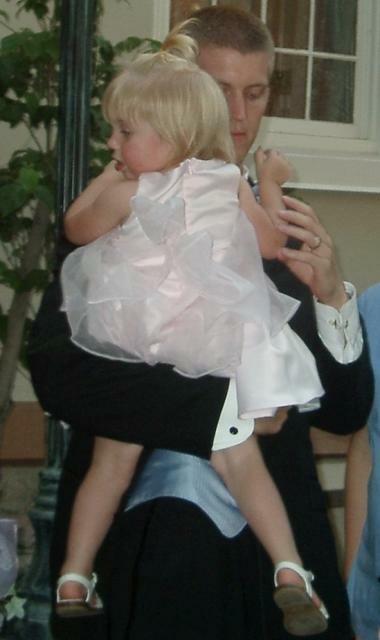 Jane in her daddy’s arms afterwards. One very small boy got into the spirit of the occasion by taking his mommy flowers: and since living ones are always better, he scooped the whole thing out of the ground, rootball and all, ever so carefully, when nobody was quite looking at the right moment–little ones move fast–and brought them to her, two footsteps away. 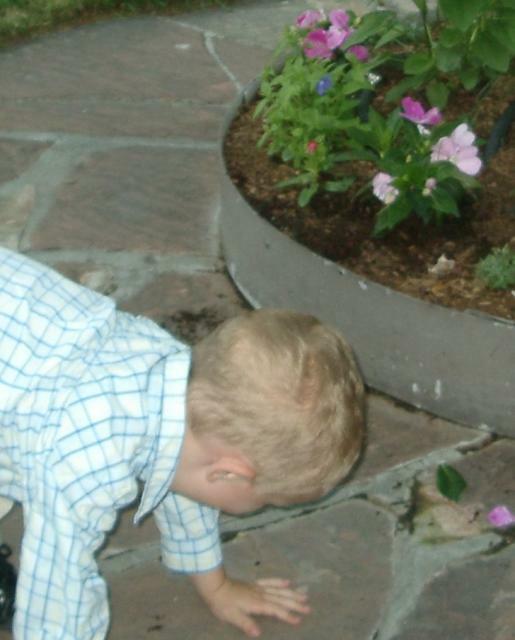 This picture was taken right after they replanted it together while I laughed and snapped his picture. The funny part was when other guests introduced themselves and asked if we were there on the Hyde side or the Williams. Uh, yes, um, wait, let me explain… The groom’s last name was the same as the bride’s mother’s maiden name (no relation, though). And his mother’s first name and her late mother’s first name were nearly the same. (Think Kara and Karen, Laura and Laurie, Janet and Janice–that sort of thing). So it took some clarifying. Jessie and her new husband at the end of the reception, ready now for Happily Ever After. They are moving to our area when they get back from their honeymoon, so we’ll get to see them often, and I can’t wait! Jetblue does that flight once a day. Yesterday’s was cancelled. We’d heard there were delays due to smoke, and yesterday’s had been delayed so far into the night that Jetblue bagged it. I was really afraid, with my asthma, of coming home to what we would find with all those new fires. So just picture my excitement, after all that worry, as we drove down the freeway: look! You can see the lights on the hills! Look! You can see the Oracle tower clearly! LOOK! It’s CLEAR!!! Richard, pleased, said the seabreeze was blowing a good one tonight. And all was right with my world. As we got further south, the sky started to muck up again, but that’s okay; I can handle it now. I saw that air further north. Maybe tomorrow I go hang out at Creative Hands yarn store (are they open Mondays?) in Belmont. How often will I ever get to claim this about a LYS: it’s for my health. Jessie’s wedding was wonderful. The skies back home in northern California, at 1100 fires now, not so much. There’s a huge temptation not to get on the return flight in a few hours. And then yesterday, driving across the foothills of Salt Lake City, one could see the smoke plume and the fire from clear across the valley: exploding propane tanks inside a burning building way out in the industrial area. Alright, alright, I’ll get on the plane–can’t run away from it, can I? It sits there, looking so innocent. Like a kid going who, me? Which was far nicer than what I would have wanted to say had I been them. Sometimes we don’t deserve our good neighbors. Our ’00 Chrysler minivan, or, for those teens-learning-to-drive years, the dentmobile, has a psychotic alarm system that maybe four times in its life now has randomly gone off of its own accord, honking and braying and kicking up its lights. How To Win Friends And Influence People. Not. Overcast, drizzly days have seemed more likely to set it off, but with the rarity of the event that might be just random attribution, akin to what Californians call “earthquake weather” (ie unseasonable warmth at a cool time of year, based on which past earthquake I have yet to figure out, but the Oct ’89 7.1 Loma Prieta got lots of comments of, well, it WAS earthquake weather…) Ie, it could be that drizzly overcast was simply what the weather was, the days that that van did its Heavy Metal act. That story wasn’t finished, though; our neighbor kept not coming home from that trip, and we around her started calling each other: have you heard? No, you? It was a month after that call that I happened to step outside to see if the mail had come yet, just at the moment S stepped out of a car dropping her off at home. She saw me, I walked over to ask how the visit with the grandkids had gone, and she threw her arms around me and bawled. They had been going to take the grandkids to the beach that one day. In Phuket. Somehow things fell apart and they just didn’t get there–which meant, when the tsunami hit, they were safe. They spent the next month visiting survivors they knew in the hospital, one of whom had seen her sweetheart pulled away from her, running relief supplies, driving the trucks, being keenly needed every single moment. And now she was coming home to a quiet house in a quiet neighborhood where nobody knew. And I happened to step into sight at exactly the moment she most needed, offering her a transition to home and a shoulder to cry on. Last night, I was making some of what is basically strawberry pie filling, for spooning onto all kinds of things to make them taste good. Strawberries pureed with a little sugar and a little cornstarch. Amount of cornstarch depends on number and runniness of the berries, and sometimes I get the equation right for it to set, but if I don’t, well, hey. Nuke for long enough to boil one minute or maybe more, but not less. Add juice of one Meyer lemon if you happen to have a tree handy. Someone was asking me about new Crohn’s meds. That’s mine. It does seem to help. I needed a lemon. I walked outside, thinking, man is it dark out here! All the ash in the sky from all the fires–842 in California at last count I heard–and all our usual city-lights-nightsky was smudged out. It looked very overcast. It was a bit strange out there. Go disable the alarm on that car tonight. I hadn’t thought of that thing in months. How do you even do that, given that it sets automatically? None of us remembered. I was going to have to look it up in the owner’s manual. A bit of a pain. Compared to what it did that one time?! Go disable that alarm. Remember how S’s whole trip started off. I’m going! And I did. Hopefully, my neighbors will never know what didn’t hit them. But it stopped me and made me realize, you know? It’s been awhile since I made a contribution to Doctors Without Borders. I need to fix that. We could use a little of the drizzly to go with our smoke about now. Nothing I can do about that. But there is something major I CAN do some small thing about. And I lay in bed last night, marveling at how the connections came to be for me. A nudge to go make sure my beeping car stays quiet. A nudge to make the world a more gentle place. For Jessie and Jeremy. The picture refused to shrink and felt in the Adobe wash, so I had to cut it with the Picasa scissors. 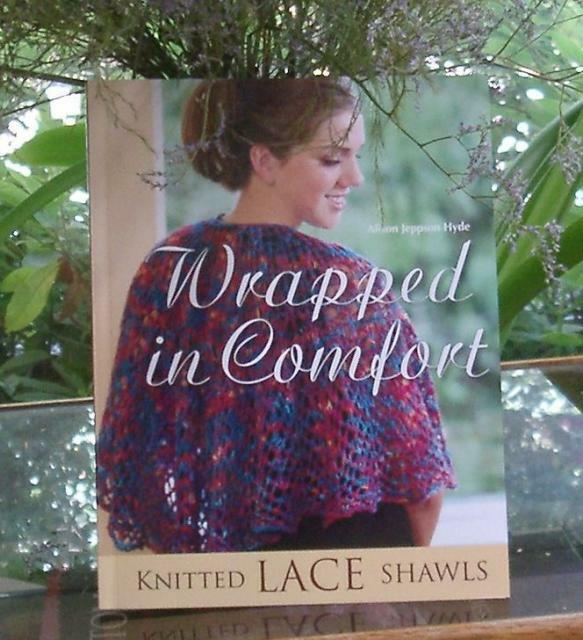 The front edges of the shawl are folded back on themselves. Thank you to those who emailed: my Crohn’s is settling back down like we told it to, and in time for their wedding, too. Isn’t it nice to have an obedient disease like that? Specs: Monterey pattern using Blue Sky Alpacas Alpaca Silk, a heavier yarn than used in the original, so I swapped out the pattern and used the Constance pattern from “Wrapped in Comfort” as a template to get a smaller stitch count. 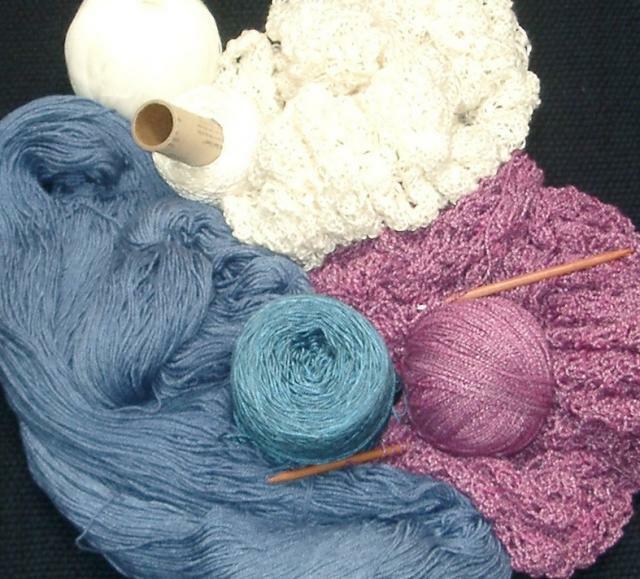 Size 10 US (6mm) needles, four skeins, using 14 g of the fourth 50g skein. Wait, Karin, here’s another lesson for you. I put down the hairdryer and went and blogged all that, came back in the room awhile later, and I’m not quite sure what the time lapse was, and it was still morning, but . Let me say first in my defense that I am hearing impaired, that I am normally very careful because I happen to know that about me; there was a fan going on in the background that was hard to hear over. When I checked the shawl again after my blogging, it was hey! Bone dry now! Cool! Maybe cool wasn’t the word. The shawl’s temperature was slightly warm. Wait a minute…I went to check the hairdryer, and burning my hand, dropped it fast. I unplugged it immediately as I realized I’d left it on the lowest setting that whole time rather than clicking it all the way to off, that I hadn’t been able to hear it was still going. The air being blown was only barely warming–no problem to the shawl. But the motor was well overheated. But that first semi-blocking gave me the information I needed to know about how much it would stretch out, and it talked me into knitting another repeat of the pattern, so I’m glad I did it. Risking burning down the house, not so much. 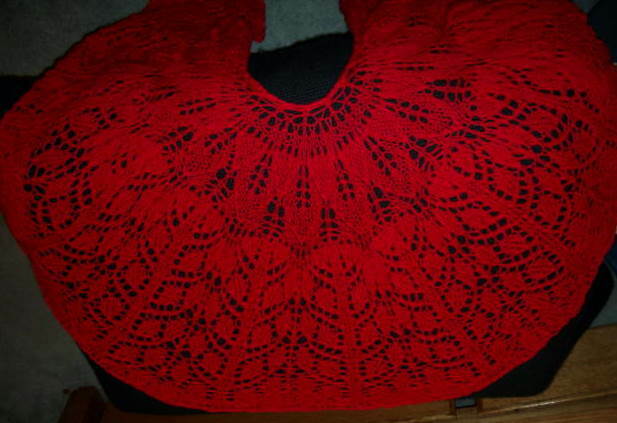 The work is done, the shawl is blocking, none the worse for any of that, I checked it this morning and even all spread out like that, the thing was still damp. I glanced a thought towards the hairdryer, and thought, not on your life. I have occasionally mentioned here and on the knitting lists my idea that if you want to get an idea of how your crumpled tin foil-y-looking stuff will look like in real life once your lace project is done, or if you simply want to like it better or show it off better while working on it, rinse it gently in tepid water, still on the needles, and lay it out to dry overnight to let the stitches settle into their natural patterns. So, knowing this was probably a dumb move, I did that last night. With about 300 stitches of a thicker-than-my-usual yarn on one not terribly long circular needle (knowing full well I should be using two or one unusually long one), all bunched up. Okay, you can see the outcome already, and so could I, but I really really needed to know how long this was getting to be, having never put that yarn with that pattern before and knowing that some silk yarns have a tendency to stretch out when wet. The overall weight of the shawl affects the hang of it more than you could learn from a small swatch, which is one excuse for why of course I didn’t swatch it; the other being, I already knew it would fit when I was done, so hey. But I did need to know that length now. Which is why I winced but took the hairdryer to it this morning. No, it’s not as long as I thought, no, I’m not done after all, and I do need to finish it today. 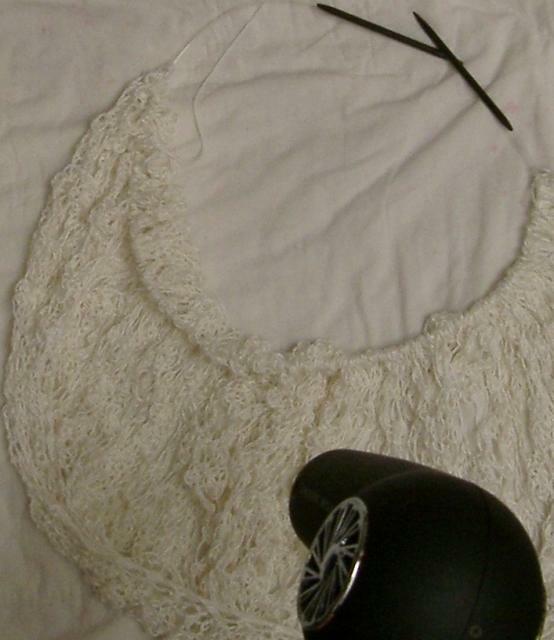 No, I do not recommend potentially shrinking your shawl with a hairdryer, so I set it on low in penitence. Before I turned it up in impatience. Lene posted a photo she took of bird tracks that were probably made by pigeons, and it instantly hit me that if you turned them towards you and drew a circle around them, you had the Peace symbol. The Dove of Peace–I wondered, whoever drew the original, was that their inspiration? So I googled, found this, and have to think they did not make that connection. But it’s fascinating how well the two symbols converge. I was reading reviews of the Shake Awake, a silent alarm clock to put under one’s pillow, and had to laugh at one person’s descriptions of why it was such an improvement for her sound-sleeper hearing-impaired son: she said that before that, they’d had to throw the cat at him every morning to get him to finally stir. I had a cardiology appointment this week, and if ever a doctor is likely to be suddenly interrupted and delayed, it’s a heart specialist. (It was just a follow-up to verify that yes, I’m fine there, my cardiac cough went away when that lupus flare did this past winter.) Definitely a bring-your-knitting appointment. As I waited, a very well-dressed elderly woman was wheeled into the waiting room by her attendant, who caught my eye, nodded at my stitches, and silently smiled at me. The old one in her string of pearls and silk sat there in her wheelchair looking terribly bored and unhappy; it took me awhile to glance down from my knitting and notice that her lower legs were scabbed over in signs of old sores, many of them. Her shoes were perfect but her skin gave her away. She avoided eye contact. I noticed her attendant had pearl earrings on too, and I thought, you’re both generous souls, then; good for you. I thought about it, then searched in my purse, looking for a particularly bright and cheerful one. And intricate. I wanted intricate. Something particularly nicely made. I found one, a toucan-looking bird, and just as the nurse opened the door and called my name, I reached across the small aisle between the seats and offered the old woman the finger puppet. A child’s toy? But an adult’s delight as well in the skill and pride that someone, somewhere in Peru had put into creating the piece. The old woman’s face totally lit up in surprise and delight, and behind her, her attendant’s did too. So did the nurse’s. I didn’t want to delay the office by stopping to describe where I get those from, that no, I didn’t knit it, so as the door closed behind us going down the hallway, I mentioned to the nurse. I figured, if the patient wanted to talk to her about it, she could tell her herself. If they had time. The nurse’s call, not mine; the important part had already happened. It’s hard to be old and lonely. Saying to somebody that they are noticed, even just in a small moment, can make a world of difference to them, and the rest of us too. It was so easy to do. My daughter had an eye doctor appointment and I don’t even remember why I came with and waited for her, but I brought my knitting and did. A woman, I’m guessing Chinese, was walking past, saw the work in my hands, and stopped on the spot and came over and sat down next to me. It is amazing what you can convey with pantomime: she had never seen circular needles before. I demonstrated how you use them just like straights, and that no, the circular shawl I was knitting wasn’t a closed circle, it was back and forth; I pulled out my book and showed her how it would look finished. Oh! 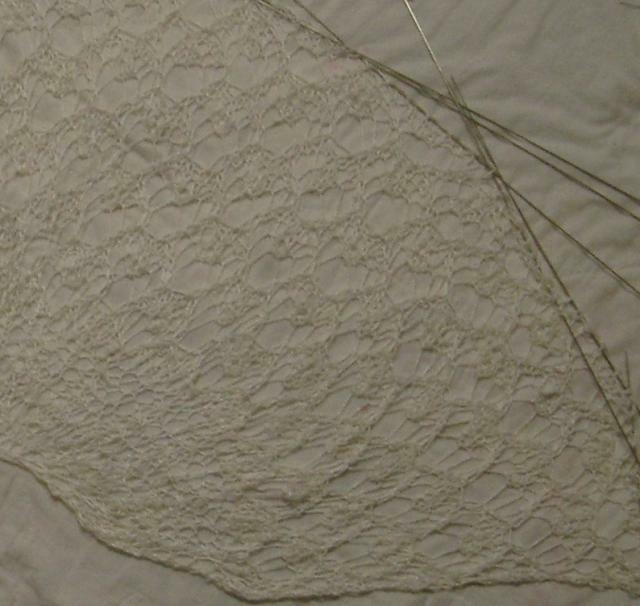 Then she wanted to know how to do lace. I taught her on the spot. Ssk, slants this way, k2tog, slants that, purl into a yarnover this way. By the time I left, she had it and she was thrilled. I couldn’t ask her how long she’d been knitting, I couldn’t ask her anything not communicated with waving hands and needles. But there is a universal joy in sharing knowledge and in learning how to do something new. I can just picture her running to me, wherever she is now, with her needles in hand to show me what she’s making now. And if you bought ME a Shake Awake, this being California, I’d probably need that cardiologist, thinking the San Andreas was going off bigtime. Slipping back towards the bad old days: I made it through about a half hour at Purlescence last night. Someone brought in their dinner and I had to move quickly away before my stomach did violence to the surroundings from the smell of the food. My daughter, who’d dropped me off and gone to the nearby library, was hovering from a few blocks away and texted me that I probably wanted to go home now? So I came home and collapsed. But not till I’d had a conversation with a fellow knitting Crohn’s patient about a new drug approved last month. There is? Really? Yay! Hopefully, though, give this a few days and it’ll settle down on its own. Meantime, Michelle had gone and looked up bluejays: they stay in pairs even when it’s not nesting season (I often see two) and they’re loud–until you get near their nest. Then they get quiet so as not to attract undue attention. To change the subject: when my husband and I got married, my parents were so happy and so glowing, you’d think they were the ones getting married! I saw the love mixed with the difference between being young and in love and middle-aged and in love, and told Richard I looked forward to the day when we too would have the time, experience, and maturity behind us like they had. I wanted to be them when I grew up. And here, a generation later, I think we’ve done okay, and here we are looking at two of our own kids and their spouses with love and gratitude ourselves. I didn’t take Jessie’s shawl to Purlescence. I figured it was too complicated to be an on-the-go project, especially when I was still at the stage of starting the main pattern and trying to keep track of the stitch count. After I got home, I picked it up and wondered if my fried brain could make sense of those jellyfish, Barbara Walker’s Showers pattern turned upside down. And you know what? To my surprise, my laceknitting had become middle-aged. No angst, no worries, just do it. Why had I thought this was hard? 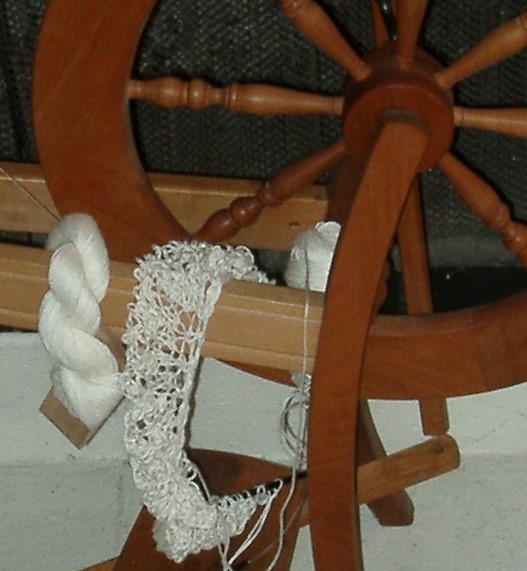 Knowing which way to wrap the yarnover when the next stitch is a knit or purl is as natural now as breathing. Knowing what to do coming up to a double yarnover is like remembering that the green light means go. The purl through back loops of three stitches at once is a meandering knit along a beautiful country road. I’ve always loved this pattern, and now we’re old friends, too. Knitpicks.com has all their books on sale, 40% off; they’ve also been sponsoring a “Wrapped in Comfort” knitalong where I’ve been checking in to see if anyone needs any questions answered. Thought I’d mention. Although, if you’d like a signed and inscribed copy, Purlescence is where to go. When I told Blue Sky, they promptly checked, found they could match it themselves, and mailed me two skeins and insisted it was on them for my troubles. So here I was thinking how I have such positive associations with that yarn, and I felt, buy the white. You’ll be glad you have it. Buy the white. I had nobody in mind, just a strong feeling. I was going through my stash (again!) looking for just the right yarn for Jessie’s wedding present, and that Alpaca Silk leaped out at me and I thought, I am SO glad I have that! And then it hit me that that matched the thought I’d had in the store. So did I immediately cast on? Was I satisfied? I confess no. I argued. I had cones’ worth of plain baby alpaca, less impressive looking, perhaps less soft, but already balled up and ready to go. I had this, I had that, and the Alpaca Silk would require prep time and I was tired. I went and watered my baby plum tree, it being about 8 pm, no UV to speak of, and then the apple trees. I splashed at the bluejay that scolded me that this was its territory (and it actually, for the first time in weeks, shut up. It’s been keeping my daughter awake at night, and it actually stood there on the branch above me, looking at me, opening its beak a few times and then not chattering anything. I do believe it finally gained some respect.) I avoided the yarn some more. I wrote a note to a friend. It’s the writing that did it–when in doubt, write it out. It hit me that thinking that that was just the right yarn and then not using it because I didn’t want to roll it up into balls and I didn’t want to have to splice them were just such dumb reasons not to use a yarn that I knew felt right. Get real. And I only had to ball up the first for the night, the rest could wait. I can’t tell you what a relief it felt to get going with what was then sitting in my hands, going, See? See? I told you so! at me. Got all that? Good. Basically, this gets you a less-full Monterey shawl on larger needles, fewer stitches, and less time taken, but in a wonderful yarn. It will have 13 stitches more across than the Wanda shawl in the Wanda yarn, and the Monterey is a mesh-type stitch with a great deal of give to it. 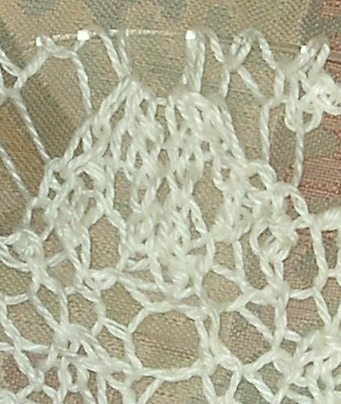 It is emphatically NOT a beginner’s lace; it’s complicated and requires lots of attention, it aggravates occasionally especially when you’re not used to it, and it comes out absolutely exquisite in the end, especially knitted up in a yarn like this. Which is why it feels like the perfect one to knit for newlyweds. Not to mention, it looks like they’ll be taking a job here. I can’t wait to show them the Aquarium in Monterey. We went to a celebration tonight, one like no other I have been to. She’d told me, when she’d called, that she wanted to “take a page from your book,” but she wrote her own here and I love her penmanship on the page of our lives that was written tonight. 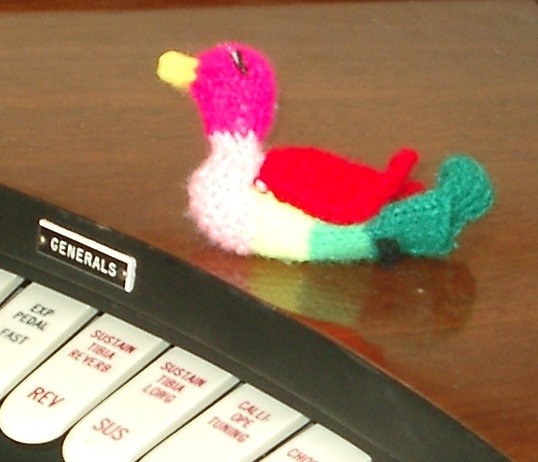 After my hospitalization, I’d thanked my doctors and nurses individually, with knitting. She brought hers home en masse. Marguerite had invited her medical team and just a very few close friends who had played roles in supporting her in her ordeal to come to her home as the time of her treatments came to an end. This was for the doctors, the nurses, the woman at the clinic who scheduled her appointments: she felt she owed much. She wanted to give back. She wanted to thank each of us for playing a role in sustaining and affirming her life in the face of her cancer, to have us celebrate with her her last week of radiation. Her teenage son snapped pictures of the small crowd, keeping record. She didn’t speak very long, just a few words that said much; she let the music, and the very act of playing it, convey the rest of it for her. Her husband Russ was on his grand piano and two friends and one of her doctors joined in with their own instruments. Joyful music, lively music, a touch of jazz here, of Bach there, music that acknowledged the grief, music that returned to the underlying joy. Music that showed life honestly and in true celebration. I can’t tell you how much it meant to me. To life! Lene tagged me yesterday with the meme about picking up a book, turning to page 123, starting at sentence five and reading the next three. 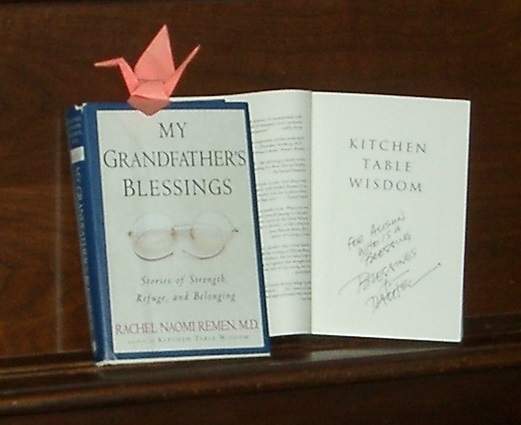 The first two books I picked up, I looked at and went, nah, so I turned to Rachel Remen‘s “My Grandfather’s Blessings,” knowing I would likely find something good there to share here. The surgeon had taken the time to create something beautiful–and one can create beauty with caring, it doesn’t have to be something physical–but he had given her a tangible, visual manifestation of his wanting her to be well. Like we who knit do with yarn ourselves. There is great power for good in the work of our hands with our hearts. “You can’t have it, Jessie, it’s mine!” Cheryl grinned at her teenager, who was stroking it. I had just given her a handspun angora scarf, simply done in a triangle shape: cast on three stitches and knit into the front and back of the last stitch on each row till it’s the size you want. 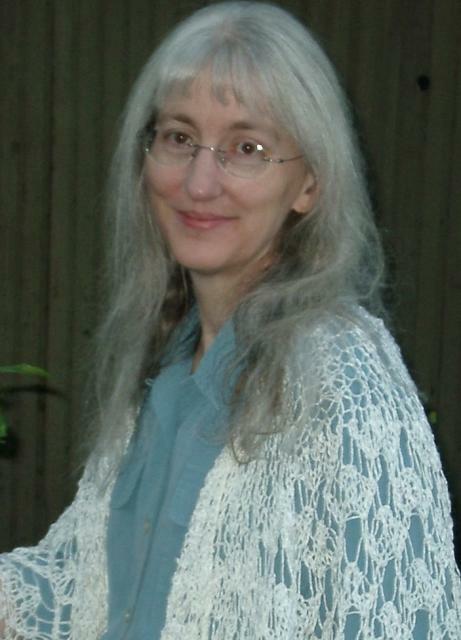 It was before I knew how to knit lace. But spinning I could do, knitting I could do, softness in the face of Cheryl’s cancer, this was what I could do to cheer her on. It had been a few years since I’d made her a Kaffe Fassett sweater at my husband’s urging at his sister’s diagnosis, which was the first time I knew my husband got this whole knitting thing: Richard had even driven an hour away across the Bay with me to Straw Into Gold to help pick out the colors. White angora this time. Cheryl beat the odds and continued on, as her doctors tried one therapy and then another. For eight years. My in-laws left this morning to help out with the next grandchild’s wedding, and I found myself taking stock: finish the cashmere and silk project. Okay, I can do that today. Keep the second WIP off to the side–that purple one that’s mostly done can wait yet a little longer, because the person getting it has no clue and there’s no rush (even if *I* want it finished. I don’t like to let things sit like that.) There’s the ocean Sea Silk I bought for my mother-in-law that needs to get started, and the blue-formerly-Bare I’d like to dive into. But. Most importantly. There’s the niece getting married in two weeks. Whichever yarn in my stash wins out, I promise you it will be something exquisitely soft. It was my first chance all day, and seemed clearly my last, to participate in World Wide Knit in Public Day. I pulled out my needles during a quiet moment, felt guilty, cast on about a dozen stitches, and stashed it quickly back in my purse. On the way home, our daughter said she needed to stop at Kinko’s a moment. Huzzah! WWKIP Day, here I come! While she was printing out some materials, I looked around: one guy looked sound asleep, waiting for his stuff to be done, another looked grimly busy, two were semi-oblivious, and one caught my eye, noticing the oddball with the yarn by the windows.